Mercedes-Benz has confirmed that it will assemble the C 300 BlueTEC Hybrid at the Thonburi Automotive Assembly Plant Co in Thailand’s Samut Prakan province. The factory, which started operations in 1979 assembling the W123, already rolls out BlueTEC Hybrid versions of W212 E-Class and the W222 S-Class. Already strong Thai demand for hybrid cars is increasing, as indicated by robust sales of Merc’s diesel hybrid models, Michael Grewe, president and CEO of Mercedes-Benz Thailand told Bangkok Post. Grewe added that the hybrid segment was attractive for investment due to the country’s favourable excise tax structure. Currently, hybrid cars are charged 10% tax compared with 17% for eco cars and 20-40% for other passenger cars. Under a new tax structure based on CO2 emissions, E85 gasohol compatibility and fuel efficiency (as opposed to engine size today, like in Malaysia), hybrids will still be entitled to a 10% rate, while the rate for eco cars will be lowered to 12-14%. Normal passenger cars will attract a 25-30% tax rate. The new structure will take effect in early 2016. Mercedes-Benz has strong momentum in Thailand. 2014 wasn’t the best of years for the Thai auto market, but the brand from Stuttgart saw sales jump by 12% to 11,328 units, a new record. The Thai luxury segment grew by 7% to hit the 20,000 mark, but Mercedes outperformed the class. In Malaysia, we recently saw a “C 300 Hybrid” in PJ. 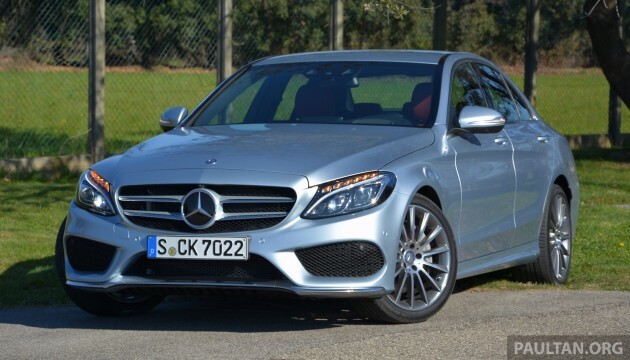 Mercedes-Benz Malaysia launched the locally-assembled E 300 BlueTEC Hybrid earlier this year – will we also be getting the C 300 BlueTEC Hybrid with an attractive price in the near future? To hell with the Malaysian government EEV policy. As usual Bolehland are only good in talking with no action. If on corruption things with get efficient. Satu lagi kegagalan EEV NAP oleh MITI. Tahniah DrM selaku bapa otomotif Thailand. Our gomen is short-sighted.. they only see the tax they can reap in short-term. Imagine if our tax structure is lower than thai & indon, we will be the hub and export to neighbouring and overseas market.. doesn’t that provide us more tax in terms of value/quantity? also this will create more job opportunity. haihhh… why do I even rant? it will fall to short-sighted deaf ears anyway…… or the blind who will not even bother. why Thailand? Why not pekan? Even if Pekan, don’t expect it to be cheap. Mercedes-Benz sold 11,328 vehicles last year, up by 12%, while BMW sold 7,465 vehicles, down 0.9% excluding Mini cars. What about in Malaysia ? Do you know the figures ? Thanks.